2014, de Gruyter, Berlin and New York, 169 p.
This article explores the prominent role of Germany in the emergence of Japan’s glider and model-aircraft boom. It examines how the invitation of German specialists to Japan in 1935 started a “glider fever” that enabled the Japanese military to forge close bonds with the press and an air-minded public. In the following years Nazi Germany also provided the organizational blueprint for comprehensive aviation education that mobilized all aviation activities of Japanese youth in the service of national defense. Japanese anxieties about the expansion of foreign air power thus were successfully channeled into a wave of popular enthusiasm and participation that became instrumental for Japan’s military buildup and mobilization. The last decade has seen large-scale cultural changes in the table grape and wine production industries of the Kōfu Basin in Yamanashi Prefecture. From the perspective of wineries, the recent rise in popularity of wines produced from the Koshu grape (Vitis vinifera var. orientalis) has secured their industrial recovery in the short term. This paper explores these changes, thereby contributing to the literature on the invention of traditions for economic profit and rural revitalization. Conclusions are drawn from archival research, interviews with stakeholders in the table grape and wine industries, and over one and one-half years as a grape farmer in the Kōfu Basin. 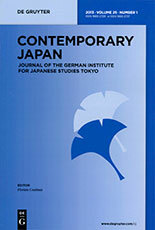 Rather than significant improvements in educational or technical advancement in growing Koshu for wine or even wine production, the rise in popularity of wines produced from Koshu is argued to be more linked to the cultural re-branding of the grape based on co-produced and glocalized perceptions of simulacra in which the historical and local consumption of Koshu wine is equated with Japanese cuisine and culture. By connecting Koshu with Japanese identity and “Japaneseness,” branded wines now provide new opportunities for conspicuous consumption and “connoisseurship” for consumers. A growing number of older people in Japan lack reliable future caretakers for their family grave. By performing numerous memorial rites and maintaining their family grave, the bereaved typically transform the family dead into benevolent ancestors. However, what will happen to those whose ashes are not interred in a family grave? In this article, I examine one alternative to the family grave system – the scattering of ashes conducted by a citizen-based group called the Grave-Free Promotion Society of Japan (Sōsō no jiyū o susumeru kai). Contrary to the common assumption that it is usually childless people who decide on ash scattering, a number of the Society’s members in fact have adult children. What are the views of people who have adopted the scattering of ashes as a way of disposing of their own remains? Given that a grave remains a symbolic locus of familial continuity, the scattering of ashes seems to challenge the cherished ideas of filial piety and respect toward ancestors. By “returning to nature” through ash scattering and joining a benevolent force larger than their small family, older urbanites seek self-sufficiency in the postmortem world and attempt to lighten the ritual burden of their survivors regarding the maintenance of their family graves. Data for this study come from extended fieldwork conducted in Japan from 2002 to 2004. By using cohort analysis, this study shows that ash scattering meets the mortuary needs of those generations that tend to lack a ceremonial asset or a culturally preferred caregiver. Japan’s society and law in particular has recently undergone some significant changes. This article identifies five of these developments that could potentially impact practices relating to the death penalty there, and investigates the effect that they have had so far. Specifically, the developments introduced are: the amendment of the Prison Law governing for the death penalty; the introduction of citizen participation in death penalty-related trials; the change of power to the Democratic Party of Japan; the adoption of new abolitionist instruments by international and regional organizations in which Japan participates; and, the possible establishment of a National Human Rights Institution with power to make recommendations to the government. I argue that at least some of these developments have had a tangible impact, and at the very least are likely to bring down the veil of secrecy currently shrouding death row inmates. Personal income tax reductions can be considered popular policies to attract volatile voters. Nevertheless, after a series of tax cuts from the rapid growth period until the 1990s, the governing Liberal Democratic Party (LDP) refrained from pursuing any more similar policy measures. This paper explores the relationship between the LDP and the electorate by focusing on tax policy. It highlights that the volatile social group of the “salaryman,” which consists of salaried workers and their families, used to have great influence on tax policy under previous LDP governments. Personal income tax reductions until the 1980s thus were meant to be salaryman tax reductions. They took place during a period when the social group of the salaryman developed into a mainstream part of Japan’s society. However, the group failed to maintain its influence after the 1990s, since when it has been diminishing both in size and in homogeneity. This paper holds that it was this decline of the salaryman population that prevented the LDP government from making any further personal income tax cuts. This article explores theoretical and popular views on the acute social withdrawal syndrome in Japan, known as hikikomori. Most sociologists contextualize hikikomori within the economic downturn of Japan and the subsequent economic pressure on individuals, also reflected in the growing number of furītā and NEET. Psychologically, hikikomori is a radical version of the otaku, the Internet and computer addict, who can communicate only within his virtual peer group. However, both sociological theories and popular narratives have recently observed a growing acceptance and even an improvement of the image of these psycho-social patterns. While the story of the charming otaku called Densha otoko (‘train man’) has been adapted into all visual media, some hikikomori, too, have been promoted to manga heroes, e.g., in Takimoto Tatsuhiko’s Welcome to the NHK and Oku Hiroya’s Mēteru no kimochi. Sociologist Ishikawa Ryōko reads hikikomori in her recent field study as a rather positive, though long-term process of self-confirmation. This change in the image of otaku and hikikomori therefore reflects a subliminal revolution of traditional and outdated Japanese concepts of obligation, work, and masculinity. The aim of this paper is to clarify in what ways school performance and out-of-school lessons are linked, with special emphasis on social disparities in educational attainment. Previous research about shadow education indicates that out-of-school education may indeed be a factor to improve the academic achievement of school students. On the other hand, it is stated nearly without exception that the socioeconomic background of a student plays a significant role for academic achievement as well. Using data of the 2009 Programme for International Student Assessment (PISA), this paper shows new findings in comparing effects of shadow education investments on students’ performance in Japan and Germany. We found that out-of-school education investments in both countries led to four significant outcomes: (i) in Japan, high school students’ academic achievement is increased due to out-of-school lessons; (ii) in both countries there is great variation in how out-of-school lessons affect academic performance according to the types of out-of-school lessons and the area of stay; (iii) out-of-school education determines higher achievement scores in international comparison in a decisive way and therefore provides a reasonable explanation for the Japanese success in PISA; and (iv) since the mid-1990s the system in Japan has advanced from a mixed to a predominantly enrichment out-of-school education system, while the German out-of-school education system is still of remedial character.